"Then it seemed like falling into a labyrinth: we thought we were at the finish, but our way bent round and we found ourselves as it were back at the beginning, and just as far from that which we were seeking at first." 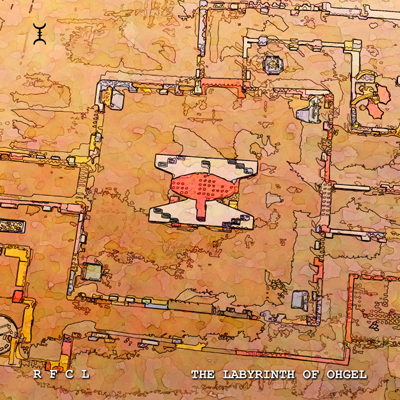 Long has the labyrinth been symbolic of death, rebirth, and the hero’s quest. Found in locations and cultures throughout the world, labyrinths and mazes have been constructed from a variety of building materials; stone, clay, foliage, and now sound. Based on a series of unique interconnected web installations, The Labyrinth of Ohgel is a dark ambient musical voyage through 14 chambers. Created from a mix of found sound and recordings, each piece is a smooth sonic construct with its own distinct mood. RFCL has recreated an ancient rite of passage in a modern form that parallels the voyage of all beings through the matrix of life. Dare to enter the Labyrinth of Oghel and explore yourself as a microcosmic mirror of the universe.